Select to bank or drop. Select your drop-style. "Standard" is waiting until the inventory is full, then dropping. "M1D1" will drop as soon as you get one in your inventory. This is the keep list. This is the fish you want to keep. When you select a fish from the fish list, all available IDs are added here. This is the drop list. 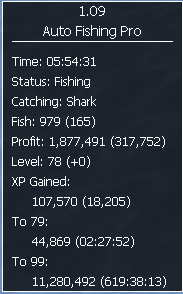 It will drop all of the fish on this list (you want to fish tuna/swordfish for instance, but drop the tuna). 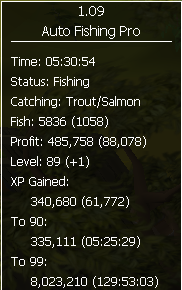 These fish will be dropped regardless of your banking options. 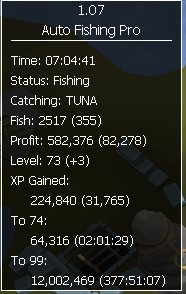 So you can drop tuna, but bank swordfish for example. Use Summoning or not. Select your familiar to the right. 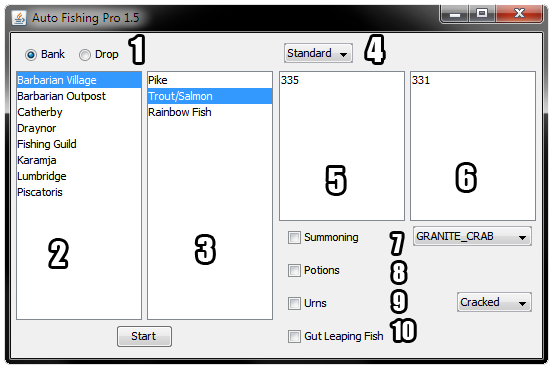 Select whether or not to use summoning potions. It will only drink one if your summoning points falls below the required amount to renew your familiar. 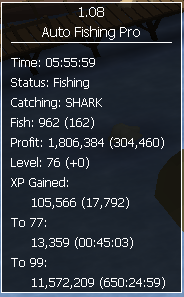 Use fishing urns or not. Select your urn on the right. 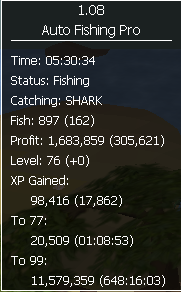 Will gut leaping fish (gives extra bait). 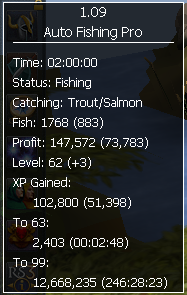 Only available when fishing Leaping Fish. Will there be a free version still available? lol how am i still using this script while im not a vip anyways PRO SCRIPT! 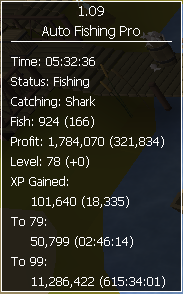 So Sad that this got moved to be well i guess off to another fisher so close to 99 fishing 120K to 98 Anyways thanks for the script while it was free. Here, use these for the client setup part of your thread, it looks better and theres no need for an entire window anyhow. Also, your script for counting users online is 404d. Noooo, damnit. Thank god I have Attendee rank. Such a good script though..
Nooo! Why did u put it in vip section! ?